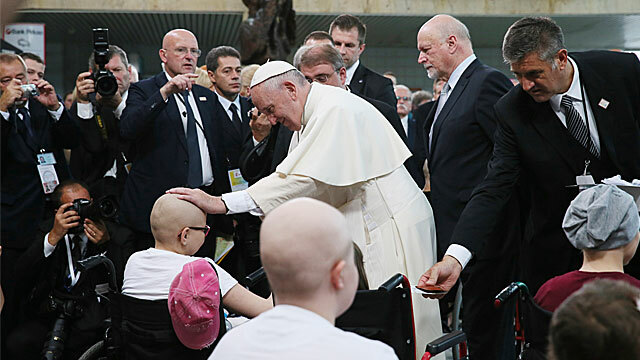 A special part of my visit to Kraków is this meeting with the little patients of this hospital. I greet all of you and I thank the Prime Minister for his kind words. I would like to draw near to all children who are sick, to stand at their bedside, and embrace them. I would like to listen to everyone here, even if for only a moment, and to be still before questions that have no easy answers. And to pray. The Gospel often shows us the Lord Jesus meeting the sick, embracing them and seeking them out. Jesus is always attentive to them. He looks at them in the same way that a mother looks at her sick child, and he is moved by compassion for them. How I would wish that we Christians could be as close to the sick as Jesus was, in silence, with a caress, with prayer. Sadly, our society is tainted by the culture of waste, which is the opposite of the culture of acceptance. And the victims of the culture of waste are those who are weakest and most frail; and this is indeed cruel. How beautiful it is instead to see that in this hospital the smallest and most needy are welcomed and cared for. Thank you for this sign of love that you offer us! This is the sign of true civility, human and Christian: to make those who are most disadvantaged the centre of social and political concern. Sometimes families feel alone in providing this care. What can be done? From this place, so full of concrete signs of love, I would like to say: Let us multiply the works of the culture of acceptance, works inspired by Christian love, love for Jesus crucified, for the flesh of Christ. To serve with love and tenderness persons who need our help makes all of us grow in humanity. It opens before us the way to eternal life. Those who engage in works of mercy have no fear of death. I encourage all those who have made the Gospel call to “visit the sick” a personal life decision: physicians, nurses, healthcare workers, chaplains and volunteers. May the Lord help you to do your work well, here as in every other hospital in the world. May he reward you by giving you inner peace and a heart always capable of tenderness.